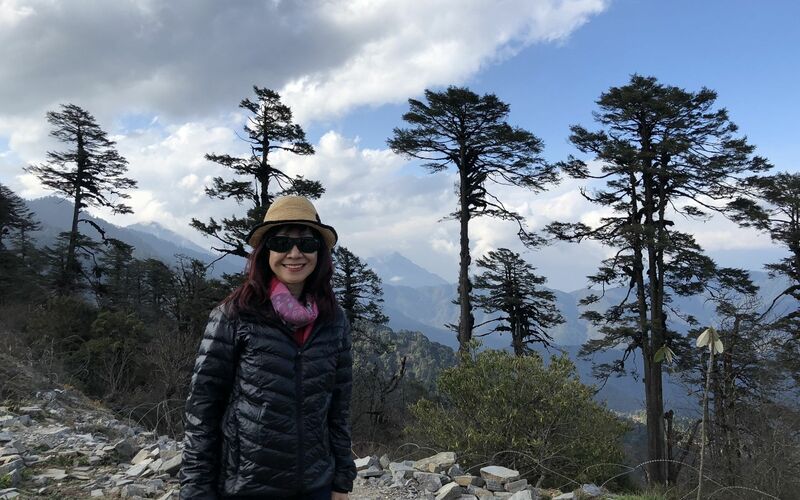 Malaysia Tatler’s very own managing director Florence Fang meets the King of Bhutan, visits a festival of happiness and takes a 3-hour trek to an ancient hilltop temple on her recent adventures in West Bhutan. A flight from KL to Bangkok and then Bangkok to Bhutan landed Florence and her tour group in the beautiful valley town of Paro. The group, led by tourism veteran Prof Datuk Seri Dr Victor Wee, arrived just in time for the first day of the Paro Tshechu Festival on the 10th day of the second Bhutanese lunar month. The cheerful noise and bright colours worn by the crowds at this 'festival of happiness' instantly lit the joyous atmosphere. Unlike other countries' measurement of happiness via economic and material growth, Bhutan's concept of 'Gross National Happiness' prioritises spiritual development alongisde material prosperity as a measure for societal development. Travel Tip: Malaysians require a visa to enter Bhutan, obtainable only through a licensed tour operator. There are no direct flights from Malaysia to Bhutan, so joining a tour group will help you manage flight arrangements and visa clearance before you leave for Bhutan. Thousands show up for this colourful 5-day dance festival each spring in the Haa Valley. Despite the long lines of cars parked along the roadsides, not a traffic light nor traffic warden was in sight as drivers naturally give way for others to move first. Overlooking the beautiful Thimphu Valley in the capital city of Thimphu stands the largest bronze statue of Buddha in the country (and one of the largest in the world), called Buddha Dordenma. Amazingly, this majestic structure houses around 150,000 smaller Buddha statues. For a donation of USD$1000, tourists can purchase a small bronze Buddha statue and place it with the thousands of other statues within this ancient Bhutanese religious monument as a personal gift. Travel Tip: You’ll have to resist snapping pictures within the Buddha Dordenma’s statue-laden interior: photography within temples, monasteries and shrines is often restricted unless you have special permission. “You wouldn’t believe you would be able to make it up to Tiger’s Nest until you force yourself to try and keep going – it’s an amazing experience,” Florence says. Florence and her tour group embarked on a 3-hour hike up the sandy slopes just to see the majestic cliff-side monastery known as Taktsang, or Tiger’s Nest. Even after ascending a part of the journey via a pony ride, most of the travelling has to be done on-foot, with the help of wooden staffs to keep balance. Travel Tip: Take extra care when descending the path from Tiger’s Nest, and be sure to opt for a wooden staff at the start of the journey – Florence says it’s easier to climb up than to return back down! Taking the Thimphu-Punakha highway heading to the Dochula Pass, Florence spotted a ‘prayer wheel’ in front of the Simtokha Dzong religious monument. According to her tour guide, Karma, the prayer wheel is an ancient Tibetan Buddhist tradition. There are millions of sutras and lineage texts wrapped within the wheel, said to have the same effect as orally reciting prayers when the wheel is spun. Though Florence’s tour group arrived at the Dochula Pass early in the morning when the weather was still misty, it soon cleared to reveal blue skies overlooking the ‘108 stupa’, a collection of war monuments or ‘chortens’ built in memory of Bhutanese soldiers killed in war. Travel tip: Pack warm clothes if you’re travelling to Bhutan anytime from November to late April, especially if you're visiting the Dochula Pass, situated about 3,050m above sea level. 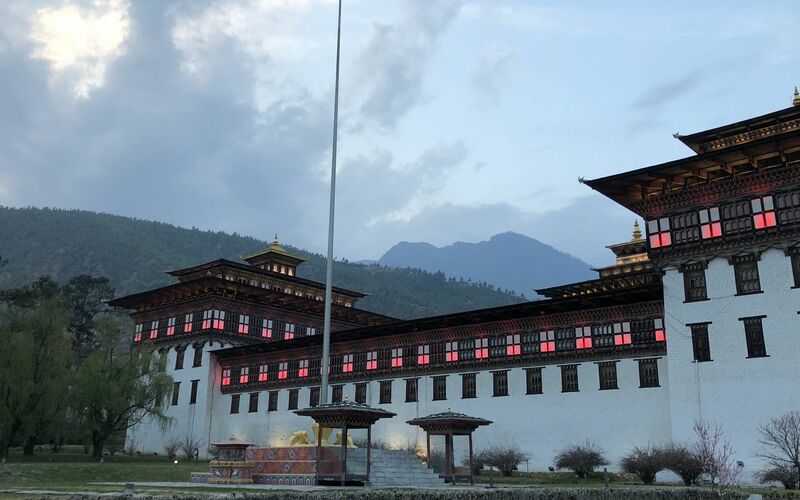 Florence recommends visiting the Tashichho Dzong building at night as well as at day to catch a glimpse of the lights that illuminate the walls. 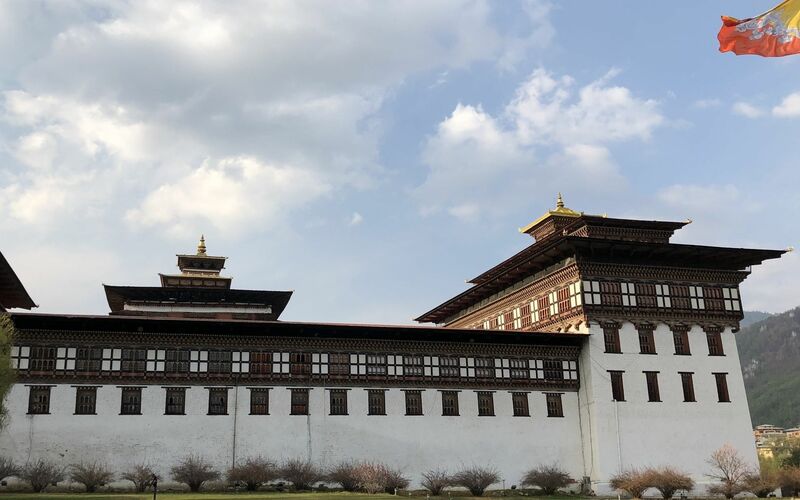 This stately fortress overlooking the Wang Chhu River houses the King’s throne room and office as well as the seat of the Dharma Raja, the head of Bhutan's civil government. Every morning, government officers march out to raise the flag, accompanied by religious leaders dressed in traditional costumes who say a prayer as the flag is raised. This nunnery complex is one classroom with the best view in the world. Florence was able to snap some pictures of the female monks who attend religious trainings here while also learning life skills like painting, tailoring, embroidery and more. Currently used as a winter residence for monks, Punakha Dzong sits atop the confluence of 2 rivers. The building carries weighty historical significance, as it’s where the first King of Bhutan was crowned in 1907. At 3,988m above sea level on the snow-laden Chelela Pass, the tour group enjoyed views of the Paro and Haa Valleys and managed to squeeze in a quick snowball match before it was time to go back. Luckily for Florence, the tour bus heading back to Paro stopped every so often, giving passengers a chance to get down and take amazing photos of uninterrupted mountain ranges, valleys and various historical monuments, all in perfect weather. The experience perfect skies, friendly people and awe-inspiring landscapes couldn’t have come to a better close as the group re-joined the merriment on last day of the Paro Tshechu Festival, only to be greeted warmly by King Jigme Khesar Namgyel Wangchuck himself. “As he was passing by, he saw us and knew we weren’t from around there. So he stopped, said hello and asked us how we were enjoying the trip so far!” Florence says.